When it comes to reading, many children lock on to one or two favourite picture books, insisting that they be read over, and over, and over. While there is recognized value in repetition (letter and word recognition, rhythm, and development of vocabulary are just a few examples), sometimes you just want to try something new! The Library is constantly adding to its collection. The following list includes some new, sure to be favourite picture books. Take a Hike, Miles and Spike! by Travis Foster and Ethan Long is an adorably illustrated picture book, with pages filled with colour. If your child has ever giggled at ‘see you later, alligator,’ this book will be a hit. 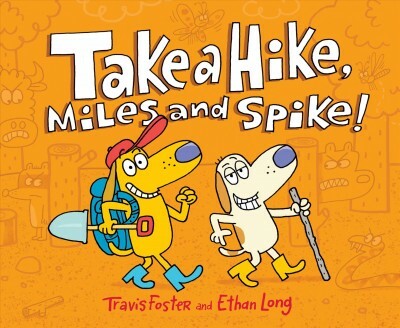 Follow along as Miles and Spike, two silly but ambitious pups, collect and pack supplies for a camping trip in the woods. Prepare to hear lines like ‘Stay loose, Moose!’ repeated frequently by your child after reading this one! Funny but packing a sweet message, Emily Gravett’s Cyril and Pat definitely deserves a read. Cyril is so lucky that he lives in a beautiful park, but he is the only squirrel and he is lonely. To his delight, he meets who he thinks is another squirrel, Pat. The two become fast friends, and have ridiculously silly adventures, but are repeatedly told that Pat is not a squirrel, but a rat, and rats cannot be friends with squirrels. They go their separate ways, and things go horribly wrong. I won’t spoil the ending! Cyril and Pat is a sweet tale about friendship, bravery, and making your own choices. Jon Agee is the author of a stack of witty children’s books with simple illustrations. His new book, The Wall in the Middle of the Book, is no exception. Gentle tones and simple faces combine with but one line of text per page. The reader will compare what they see with the words being read, and learn quickly that not everything is as it seems. The little knight in the story is supposed to be protected by the wall in the middle of the book, but as the story progresses, the reader sees what the knight seems unaware of. 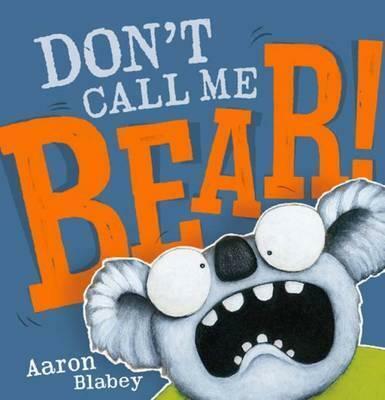 If your child enjoys Aaron Blabey’s Pig the Pug series, add Don’t Call Me Bear! to your reading wish list. Told in rhyme, this story about an indignant koala is a fabulous read aloud. Warren the koala has something important to discuss, and he does not want any misunderstandings! Hilarious text and illustrations merge in this fun and educational read. Julia Donaldson’s The Gruffalo is a favourite in many homes. Her latest picture book, The Cook and the King, stars a hungry king who desperately needs to find a cook. Chef after chef disappoint him, until he meets Wobbly Bob. Is Bob up to the task? You’ll have to read on to find out! There’s a bit of a trick in this book, and it’s interesting to see if young readers and listeners can pick up on what’s happening. This is another story that is an enjoyable read aloud with lots of opportunity to add emotion. As an added bonus, this book is illustrated by David Roberts, whose work includes Rosie Revere, Engineer and Ada Twist, Scientist. These are but a few of the new items in the Library! Stop in to visit and check out the new book displays or grab an old favourite. As always, feel free to ask our staff for suggestions; we’re always happy to help! Jana O’Flaherty – www.tbpl.ca. If you have a comment about today’s column, we would love to hear from you. Please comment below!